Gosbank (Russian: Госбанк, Государственный банк СССР, Gosudarstvenny bank SSSR—the State Bank of the USSR) was the central bank of the Soviet Union and the only bank whatsoever in the entire Union from the 1930s to 1987. Gosbank was one of the three Soviet economic authorities, the other two being "Gosplan" (the State Planning Committee) and "Gossnab" (the State Committee for Material Technical Supply). The Gosbank closely collaborated with the Ministry of Finance of the USSR to prepare the national state budget. The foundation of the bank was part of the implementation of the New Economic Policy. On 3 October 1921, the All-Russian Central Executive Committee (VTsIK), passed a resolution for the founding of the State bank of the Russian Soviet Federative Socialist Republic. This was followed by a similar resolution passed by Sovnarkom on 10 October 1921. It began operations on 16 November 1921. In February 1922 Lenin described the State Bank as a "a bureaucratic paper game", comparing it to a Potemkin village in a letter to Aron Sheinman who he accused of being a "Communist-mandarin childishness". In 1923 it was transformed into the State Bank of the USSR. It was placed under the jurisdiction of Narkomfin. The Soviet state used Gosbank, primarily, as a tool to impose centralized control upon industry in general, using bank balances and transaction histories to monitor the activity of individual concerns and their compliance with Five-Year Plans and directives. Gosbank did not act as a commercial bank in regard to the profit motive. It acted, theoretically, as an instrument of government policy. Instead of independently and impartially assessing the creditworthiness of the borrower, Gosbank would provide loan funds to favored individuals, groups and industries as directed by the central government. In 1931 Boris Berlatsky, a senior official of the State Bank was put on trial for wrecking as part of the 1931 Menshevik Trial. 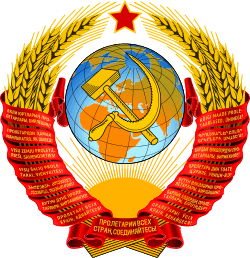 As part of Mikhail Gorbachev's perestroika program, other banks were formed, including; "Promstroybank" (USSR Bank of Industrial Construction), "Zhilstoybank" (USSR Bank of Residential Construction), "Agrobank" (USSR Agricultural Bank), "Vneshekonombank" (USSR Internal Trade Bank), and "Sberbank" (USSR Savings Bank). "Sberbank" continues to this day as one of Russia's largest banks, retaining senior ex-Gosbank personnel and most of the present Russian government's banking business. This is the list of the Chairmen of the Board of the State Bank. ↑ Lenin, Vladimir (1922). Letter to A. L. Sheinman. Progress Publishers. Retrieved 26 May 2015. 1 2 "The State Bank of the USSR". Bank of Russia Today. Bank of Russia. Retrieved 26 May 2015. ↑ Jasny, Naum (1972). Soviet Economists of the Twenties. London: Cambridge University Press.